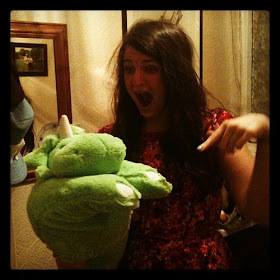 t*rexes and tiaras: Out with the old, In with the new.. Anyone else thrilled by the thought of spring, this year? I do seem to be anticipating it more than I recall doing so in previous years. That could be a result of ALL OF THE PRETTY THINGS in the shops at the moment. I mentioned in last week's wishlist post that all of a sudden, all of the shops seem to have got their pretty things in. So, although I don't often do this, I thought I'd share some of the things I've been buying lately. Having been very much in Spring Clean mode for the past few weeks, I've been doing quite well at being ruthless and ridding myself of the things I no longer wear. Some of this has gone to the blog sale, anything tatty or worn or faded from the sunlight has gone to my local clothes charity bin. This means that I've made a little space in the wardrobe room. And promptly filled it back up again, but can you blame me? Matalan have been absolutely killing it lately with their new season clothing. I have to admit, after they tweeted a sneaky pic at the end of last year, the organza skirt has been on my radar for a while, so I snapped it up just as soon as I could find it in store (as have, by the looks of my Instagram feed, just about everyone else I follow!) 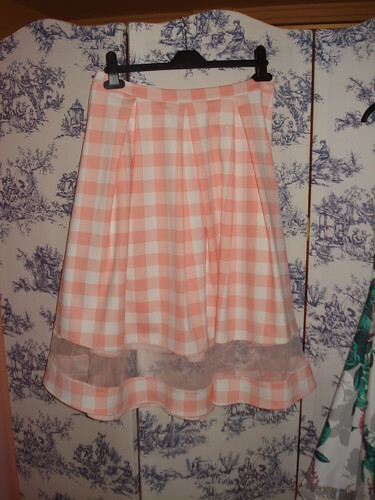 I love the checks and the pretty organza section - it makes me think of Grease, and 50s milkshake bars. In fact, so do a lot of the things I've bought recently. The organza dress and the two polka dot jumpers are also from Matalan. The dress is the same fabric as the skirt and I think the weight of it should mean that it hangs really nicely. As for the jumpers, I know that Spring should mean better weather, but for now I seem to be embracing layers. Plus, we had hailstones at the weekend - WTF? I couldn't resist the polka dots due to their textured effects (and more pretty pastel colours). I have a thing about pastels and can't help hearing Meryl Streep's voice in The Devil Wears Prada misquoting "pastels for spring, groundbreaking." But never mind. I couldn't resist the pink cropped jumper after seeing it on Rachel's blog, and when I got to the F+F site, it had been reduced to half price (£8, which is a bargain in my book). I ordered it with free click and collect and it was there the following lunchtime. The River Island top was a bit of an impulse buy; I couldn't resist the embellishment despite not knowing quite how I'm going to style it - it seems to be mroe of a "with jeans" top, which isn't something I wear, but I think I'm going to try it over dresses. 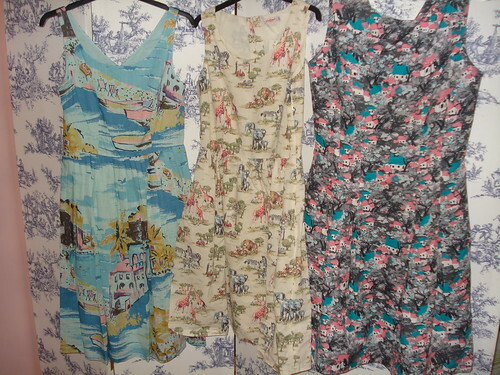 The Boden Nancy dress and Great Plains Tuscany dress have both featured on my wishlists, as I've been waiting for them for a while. I pre-ordered the Nancy dress from Boden as soon as I was able to do so, as I didn't want to miss it when it came out, and it arrived last week. I love the mix of colours and the length is pretty good on me (I'd been deliberating between long and regular, this is the regular). I envisage it will get a lot of wear when the sun starts to show itself. 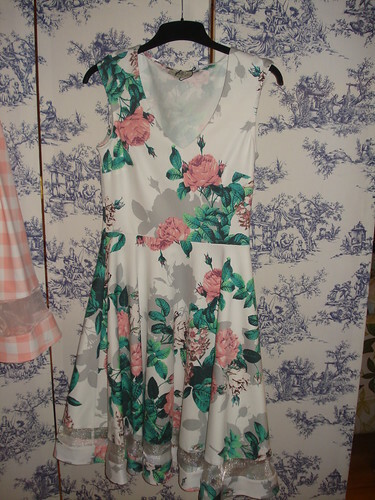 The Cath Kidston dress was my purchase from their flagship store on my recent London trip. Jazmine kindly invited me to the #180Piccadilly safari party, which I was able to show my face at, because it happened to be the same day I was in the capital for my Queen's Guide presentation. I'd planned to purchase the safari print playsuit (another thing I've been waiting eons for the arrival of) but after trying it on, I decided I liked the dress version better. Oh wow, quite the essay. I think that's all I have to say about my pretty new things, other than that I can't wait to wear them all. What have you been buying lately? Are you excited for the arrival of spring? Aw, thanks. I'm so excited about spring and the weather changing to start wearing them. You should definitely get it, it's so lovely! I'd been a little put off by the length to begin with but I like it! So many pretty pastel colours. I can't wait to see how you style all your new pieces. The only piece of clothing I've bought recently is a polka dot jumper from H&M although I did purchase the Elisalex dress pattern from By Hand London yesterday which I'm very excited about. I'm currently considering the Flora pattern. That skirt and dress is really from Matalan? I don't believe you, in fact I'm heading down to Matalan to check it out because I love that skirt so much! Oh I'd seen that Matalan skirt in previews and was looking out for it, it's gorgeous. Well, I haven't been shopping or even out for months, so I've been limited in my spending, especially as it's gone on expensive IC bags and shoes! I love that Boden dress, haven't seen it before. We had hailstones too, with bright sunshine, it was sooo random, I've never seen it do that when it's so sunny. Oh gosh, I've been so excited by all of the new things lately that I seem to have bought loads! It's so lovely and heavier fabric than I'd anticipated. 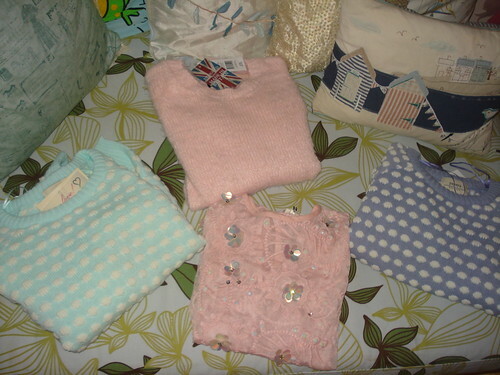 They're so lovely, I'm imagining all kinds of pastel jumper combinations. I LOVE your Boden dress :) I am eagerly awaiting spring and have been buying B.A.I.T shoes on sale lately. Love! I had snow today!! Boo!! Snow?! That's mad. We had such sunny days a couple of weeks back but now it's cold again. I LOVE the skirt! Soo pretty (as is everything else)! 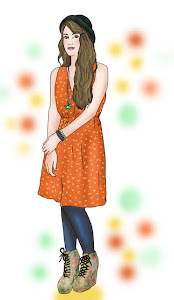 These are the kind of clothes that just make you happy :) Lovely post.